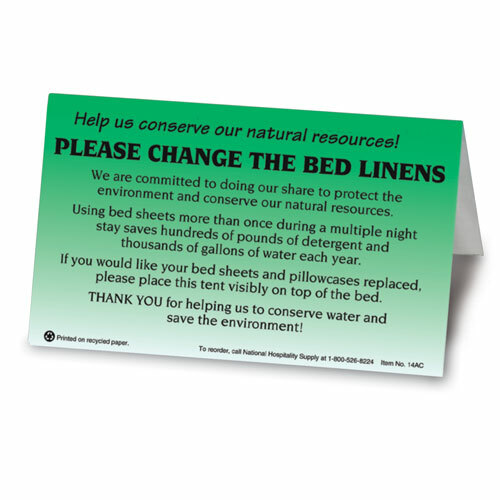 "Please Change the Linen's" tent signs encourage guests to be committed to helping the environment and your property save on water costs, labor time involved in laundering, and detergent. 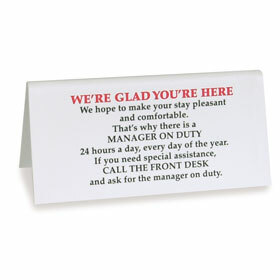 LodgMate recommends putting the tent signs on bedside nightstands or near the media chest. Each morning guests can place the sign on the bed indicating to your housekeeping staff they would like fresh linens for the night. Folded tent dimension: 5"W x 3"H. Signs are sold in packs of 100.